K2 CADIZ is a Spanish language school located in one of the most typical squares of the heart of Cadiz city. Since 2001, we have been organising Cervantes Institute accredited Spanish immersion programs for adults and juniors offering the highest quality of service. Our courses have also been approved by Swedish – CSN – and German – Bildungsurlaub – governments. Our Spanish school is the only Spanish school located in the center of Cadiz city and is placed in a restored historical building dating from the 19th century carefully decorated and equipped with modern amenities. Bright comfortable classrooms with TVs, free Wi-Fi, computer room, salon with a projector and dance floor. The school has also a beautiful kitchen for our famous cookery classes, a library with free self-study materials, help desk staff and a terrace ideal for our parties and for chatting with your fellow students. Our great variety of online and face-to-face courses fit the needs of all students for an affordable price. They are intended to make it as easy as possible for you to learn and speak Spanish from your very first class. The smaller classes and personal attention of our highly qualified native teachers will make you learn Spanish and enjoy in the best ambience. You can also do your DELE exams or CCSE exams directly in our school as we are an official examination center. In order to provide you with constant opportunities to speak Spanish and made the most of your stay, the courses are combined with a wide range of sports, cultural and social activities. All of them will take you to fall in love with our culture and know more about our way of life. The staff of K2 CADIZ are here to help you organize your trip, including your accommodation, pick up service and assistance for visa application. If you don’t want the hassle, leave it to us and we will take care of everything. K2 CADIZ, the only school in Cadiz who offers all of these and much more! I thoroughly enjoyed my time at K2 Cadiz. The school’s warm and friendly atmosphere made it easy to settle in quickly and to feel confident to speak up during the lessons. My teacher kept her classes engaging with a good combination of conversation, grammar, reading comprehension, and games. The breaks during the day also made it easy to get to know classmates outside of lessons. Classes finished at 2pm so there was plenty of time in the afternoon/ evening to enjoy all that this vibrant city has to offer! The school also organises activities every week which are another great way of meeting new people and making friends. I would highly recommend the school to anyone who wants to improve their language skills or to those starting from scratch! Thankyou K2 for a wonderful experience. I did enjoy my Spanish course at K2 Internacional in Cadiz. The teachers are great, they conduct the classes in an enjoyable and effective way and, moreover, they make you speak Spanish from the very first class, even though you’re a beginner, I think it’s a very important aspect while learning a foreign language. Also, Cadiz, as a city, is fantastic so I would highly recommend coming here and learning Spanish at K2 Internacional. Perfect Spanish School in Andalucia! Great school! Before I came here I didn´t know a word in Spanish, and after studying here for six weeks I´m really happy with the progress I made and I´ll stay in Cádiz for another three months for work. The atmosphere in the school is very familiar and the teachers are all really friendly, patient and helpful. The school´s unique location at a lively small square in the old town of Cádiz allowed me to easily discover the beautiful city by foot and to take advantage of all the events going on here. I felt at home and safe in the city, and really enjoyed my stay in the school and the town. Also, I quickly made friends with a lot of other students from different countries who I spent my free time with. I can only recommend K2! I am completely satisfied with my decision to learn spanish in K2 INTERNACIONAL. I came here as a beginner and could not speak even a bit spanish, nevertheless my teacher Marie Luz was so patient and repeated every single word till I understand it. During my whole stay I felt so comfortable and at home because all teachers are permanently carrying about you and just let you feel comfy and carefree. Only after two weeks I was able to have small talks and understand the content of what people are talking about. Although the teachers are expecting you to participate permanently you never feel under pressure because of the nice atmosphere. The Place of the school is just perfect, delicious coffees and breakfasts are right next to the school so you can enjoy it during your break. It was an enjoyable stay, thank you K2 INTERNACIONAL for your help and support every time. This experience will always stay in my mind. Sehr nettes Team, stets hilfreich und offen! lehrreich und amüsant für alle Altersgruppen! Kann ich nur weiterempfehlen! One of the best trips I have done so far. The school is really beautiful and familiar. I was there for 2 weeks and it was great. The classes are small and the teacher I had was really good. I learned different stuff and not only new grammar, so the course was really active with some games and activities to practice the language. In the afternoon they had some activities for the students to explore the city and to get more in contact with the other students. So for example they offer every week a free tour through the city to get a first overview over Cadiz. 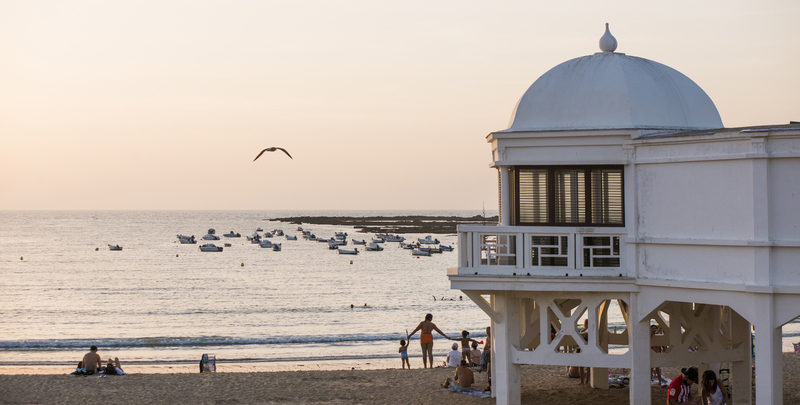 Moreover Cadiz is a beautiful old town with great weather and different beaches. That was also one reason why I chose Cadiz. I wanted to combine learning Spanish with the possibility to go to the beach and to go surfing. In the end I made some new friends from different parts of the world and I would like to go back for sure. So I can really recommend it!!! This is one of the best language schools I have been to and deserves nothing less than 5 stars! The teachers are all incredibly friendly and enthusiastic, which helps to get all the students in the group involved. They are also very helpful and informative about life outside the classroom as well, they often gave me recommendations for my free time. The school itself has a very friendly and welcoming atmosphere, which was the most important thing when I had travelled to a foreign country and was living in a whole new city. They had activities organised for the students most afternoons that helped us to get to know the city and understand the language a lot better. Overall, I would recommend to anyone wanting to study Spanish in Spain that they consider this school as it has left me wanting to go back and wishing I had more time to spend in Spain.This is one of the best language schools I have been to and deserves nothing less than 5 stars! The teachers are all incredibly friendly and enthusiastic, which helps to get all the students in the group involved. They are also very helpful and informative about life outside the classroom as well, they often gave me recommendations for my free time. The school itself has a very friendly and welcoming atmosphere, which was the most important thing when I had travelled to a foreign country and was living in a whole new city. They had activities organised for the students most afternoons that helped us to get to know the city and understand the language a lot better. Overall, I would recommend to anyone wanting to study Spanish in Spain that they consider this school as it has left me wanting to go back and wishing I had more time to spend in Spain. K2 Internacional is a truly welcoming place. The staff and professors are always ready to answer any questions that might arise, be it about that one tense that You can`t really wrap your head around or about where to find the best tapas in the city. It really does help You to immerse yourself in to the local culture. That`s another plus - the school is located in the old city of Cadiz. For me it was a very inspiring to know that I am at the heart of the city, that turns to be one of the oldest in Europe and to be able to learn about the culture and work on my Spanish. I truly recommend this school and hope to return some day! K2 Internacional, es una escuela en Cádiz la cual enseña español a los extranjeros, personalmente me ha servido para aprender mejor el idioma, además de conseguir un buen nivel de conversación y experiencia para poder defenderme en el extranjero. Ha sido una experiencia muy importante para mi futuro laboral ya que quiero relacionarme con España y su cultura. Por eso estoy muy contenta de haber elegido K2 Internacional puesto que la escuela está ubicada en Andalucía lugar donde tanto su gente como su cultura son fantásticas. Die Schule K2 ist eine der besten Schulen in Cádiz – das sagte mir auch schon mein Vermieter. Das historische Gebäude ist komplett saniert, alles ist in schönen Farben gestrichen und bildet eine gute Lernatmosphäre. So gibt es zum Beispiel eine Küche, die auch den Schülern zur Verfügung steht. In den Pausen kann man dann gemeinsam essen. Die Lehrer sind ausgesprochen gut, freundlich und bemüht, wirklich das Spanisch in einem herauszukitzeln. Spanischstunden vergehen wie im Flug und man wird mit allem versorgt, was man zum Spanisch lernen braucht. K2 in Cádiz ist nur zu empfehlen!